Reading and share top 179 famous quotes and sayings about Echoes by famous authors and people. Browse top 179 famous quotes and sayings about Echoes by most favorite authors. 1. "Here we live in the illusion of happiness where we forget that we were created to handle the balance not just to bear it. We brought into being from nothingness not to live in deep wells of subconscious and be satisfied on the echoes of the convoys we came to hear. We are here to spread the wings of happiness, purposefully built in within ourselves to come out from the wells of our falsification of self and bring forth the real us …. The ones with compassion, kindness and self- esteem shaping in perfection the most gifted creation of the most powerful creator and to become part of these immortal convoys for the times to come." 2. "I felt emptied-out and singing with echoes, unrecognizable to myself: that particular feeling like your own house on the day you move out." 3. "I spoke a word in anger To one who was my friend, Like a knife it cut him deeply, A wound that was hard to mend. That word, so thoughtlessly uttered, I would we could both forget, But its echo lives and memory gives The recollection yet. 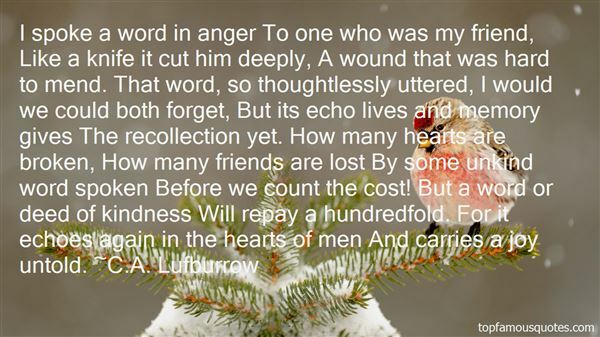 How many hearts are broken, How many friends are lost By some unkind word spoken Before we count the cost! But a word or deed of kindness Will repay a hundredfold. For it echoes again in the hearts of men And carries a joy untold." 4. "Imagine, [Kriezler] said, that you enter a large, somewhat crumbling hall that echoes with the sounds of people mumbling and talking repetitively to themselves. All around you these people fall into prostrate positions, some of them weeping. Where are you? Sara's answer was immediate: in an asylum. Perhaps, Kreizler answered, but you could also be in a church. In the one place the behavior would be considered mad; in the other, not only sane, but as respectable as any human activity can be." 5. "I have sometimes sat alone here of an evening, listening, until I have made the echoes out to be the echoes of all the footsteps that are coming by and by into our lives. "Jerry, say that my answer was, 'RECALLED TO LIFE." 6. "Come in, O strong and deep love of Jesus, like the sea at the flood in spring tides, cover all my powers, drown all my sins, wash out all my cares, lift up my earth bound soul, and float it right up to my Lord's feet, and there let me lie, a poor broken shell, washed up by his love, having no virtue or value; and only venturing to whisper to him that if he will put his ear to me, he will hear within my heart faint echoes of the vast waves of his own love which have brought me where it is my delight to lie, even at his feet for ever." 7. "The music echoes in the emptiness. It reminds us where we came from and where we're bound." 8. "I have longed to move awayFrom the hissing of the spent lieAnd the old terrors' continual cryGrowing more terrible as the dayGoes over the hill into the deep sea;I have longed to move awayFrom the repetition of salutes,For there are ghosts in the airAnd ghostly echoes on paper,And the thunder of calls and notes.I have longed to move away but am afraid;Some life, yet unspent, might explodeOut of the old lie burning on the ground,And, crackling into the air, leave me half-blind.Neither by night's ancient fear,The parting of hat from hair,Pursed lips at the receiver,Shall I fall to death's feather.By these I would not care to die,Half convention and half lie." 9. "Water, wind and birdsong were the echoes in this quiet place of a great chiming symphony that was surging around the world. Knee-deep in grasses and moon daisies, Stella stood and listened, swaying a little as the flowers and trees were swaying, her spirit voice singing loudly, though her lips were still, and every pulse in her body beating its hammer strokes in time to the song." 10. "There is no basis for democracy except in a dogma about the divine origin of man. That is a perfectly simple fact which the modern world will find out more and more to be a fact. Every other basis is a sort of sentimental confusion, full of merely verbal echoes of the older creeds. Those verbal associations are always vain for the vital purpose of constraining the tyrant." 11. "Yet man dies not whilst the world, at once his mother and his monument, remains. His name is lost, indeed, but the breath he breathed still stirs the pine-tops on the mountains, the sound of the words he spoke yet echoes on through space; the thoughts his brain gave birth to we have inherited to-day; his passions are our cause of life; the joys and sorrows that he knew are our familiar friends--the end from which he fled aghast will surely overtake us also!Truly the universe is full of ghosts, not sheeted churchyard spectres, but the inextinguishable elements of individual life, which having once been, can never die, though they blend and change, and change again for ever." 12. "It's not the dead even. They're gone. Nothing you can do about that. It's what's left behind - the echo. These woods you're walking through. There are some old timers who think a sound echoes here forever. Makes sense when you think about it. That Billingham kid. I'm sure he screamed. He screams, it echoes, just bounces back and forth, the sound getting smaller and smaller, but never entirely disappearing. Like a part of his is still calling out, even now." 13. "The voice of the light remains ever so faint; images quiet as ancient constellations float across the domw of my dawning mind. They are indistinct fragments that never merge into a sensate picture.There would be a landscape I have not seen before, unfamiliar melodic echoes, whisperings in a chaos of tongues." 14. "Ye who love the haunts of Nature, Love the sunshine of the meadow, Love the shadow of the forest, Love the wind among the branches, And the rain-shower and the snow-storm, And the rushing of great rivers Through their palisades of pine-trees, And the thunder in the mountains, Whose innumerable echoes Flap like eagles in their eyries;-Listen to these wild traditions, To this Song of Hiawatha!" 15. "Anon from the castle wallsThe crescent banner falls,And the crowd beholds instead,Like a portent in the sky,Iskander's banner fly,The Black Eagle with double head;And a shout ascends on high,For men's souls are tired of the Turks,And their wicked ways and works,That have made of Ak-HissarA city of the plague;And the loud, exultant cryThat echoes wide and farIs: "Long live Scanderbeg!" 16. "My most resolute opponents believe that I am too visible, that I am a little too alive, that my name echoes too much in the texts which they nevertheless claim to be inaccessible." 17. "She heard the echoes of Ian's screams in her head. Beth pressed her forehead to his hands, her heart wrenching. Ian's hands were large, sinews hard under his kid-leather gloves. Yes, he was strong. In the Tuileres Gardens, it had taken both Mac and Curry to pull him away from Fellows. That didn't mean others could try to tear at that strength, try to defeat him. The doctors in the horrible asylum had done it, and now Fellows was trying to.I'm falling in love with you, she wanted to say into their clasped hands. Do you mind awfully?" 18. "Somehow, bad news, however ridden with static, however filled with echoes, always manages to be conveyed." 19. "I am reading The Lord of the Rings. I suddenly wanted to. I almost know it by heart, but I can still sink right into it. I know no other book that is so much like going on a journey. When I put it down to this, I feel as if I am also waiting with Pippin for the echoes of that stone down the well." 20. "The musician may sing to you of the rhythm which is in all space, but he cannot give you the ear which arrests the rhythm, nor the voice that echoes it." 21. "Then said a teacher , speak to us of teaching . And he said :The teacher who walks in the shadow of the temple among his followers gives not of his wisdom but rather of his faith and his lovingness.The astronomer may spaeak to you of his understanding of space , but he cannot give you his understanding.The musician may sing to you of the rythem which is in all space , but he cannot give you the ear which arrests the rythem nor the voice that echoes it .And he who is versed in the science of numbers can tell of the regions of weight and measure , but he cannot conduct you thither .For the vision of one man lends not its wings to another man ." 22. "A broken heart in real life isn't half as dreadful as it is in books. It's a good deal like a bad tooth, though you won't think THAT a very romantic simile. It takes spells of aching and gives you a sleepless night now and then, but between times it lets you enjoy life and dreams and echoes and peanut candy as if there were nothing the matter with it." 23. "A tale begun in other days,When summer suns were glowing -A simple chime, that served to timeThe rhythm of your rowing -Whose echoes live in memory yet,Though envious years would say 'forget." 24. "On Drinking Alone by MoonlightHere are flowers and here is wine,But where's a friend with me to joinHand in hand and heart to heartIn one full cup before we part?Rather than to drink alone,I'll make bold to ask the moonTo condescend to lend her faceThe hour and the scene to grace.Lo, she answers, and she bringsMy shadow on her silver wings;That makes three, and we shall be.I ween, a merry companyThe modest moon declines the cup,But shadow promptly takes it up,And when I dance my shadow fleetKeeps measure with my flying feet.But though the moon declines to tippleShe dances in yon shining ripple,And when I sing, my festive song,The echoes of the moon prolong.Say, when shall we next meet together?Surely not in cloudy weather,For you my boon companions dearCome only when the sky is clear." 25. "I'm losing the appetite for strangers. Once I would have focused on the excitement, the hazard; now it's the mess, the bother. Getting your clothes off gracefully, always such an impossibility; thinking up what to say afterwards, without setting the echoes going in your head. Worse, the encounter with another set of particularities: the toenails, the ear-holes, the nosehairs. Perhaps at this age we return to the prudishness we had as children." 26. "All right," said Eden. "After all, we've got to hide somewhere. And even if they move on a bit faster than we can, they'll still leave signs, won't they? "Yes, they'll drip blood and leave echoes of people laughing," said Timon in a dark voice. Eden looked at him apprehensively. But then Timon laughed himself. "Joking! Joking! Only joking!" he cried, and Eden nodded, echoing his laughter rather uncertainly." 27. "Now there was nothing but awful, terrible silence. Sight is a sense outside and apart from the body, an image on the surface of the eye. But sound enters the ears, the head, it lives inside. In sound's absence, silence echoes." 28. "To seek in the great accumulation of the already-said the text that resembles 'in advance' a later text, to ransack history in order to rediscover the play of anticipations or echoes, to go right back to the first seeds or to go forward to the last traces, to reveal in a work its fidelity to tradition or its irreducible uniqueness, to raise or lower its stock of originality, to say that the Port -Royal grammarians invented nothing, or to discover that Cuvier had more predecessors than one thought, these are harmless enough amusements for historians who refuse to grow up." 29. "Empathy is about finding echoes of another person in yourself." 30. "Evil is predictable.' A lie. Because sometimes evil was an insidious thief that crept in and stole what you most treasured, leaving only echoes against a wall.A thin shadow, swinging almost gently. Like on a swing." 31. "It was reasonable to struggle, to suffer, perhaps even to die, for a more just, a more compassionate society, but not in a world with no future where, all to soon, the very words "justice," "compassion," "society," "struggle," "evil," would be unheard echoes on an empty air." 32. "The person who tries to live alone will not succeed as a human being. His heart withers if it does not answer another heart. His mind shrinks away if he hears only the echoes of his own thoughts and finds no other inspiration." 33. "The painting showed a hairless, oppressed creature with a head like an inverted pear, its hands clapped in horror to its ears, its mouth open in a vast, soundless scream. Twisted ripples of the creature's torment, echoes of its cry, flooded out into the air surrounding it; the man or woman, whichever it was, had become contained by its own howl. It had covered its ears against its own sound. The creature stood on a bridge and no one else was present; the creature screamed in isolation. Cut off by - or despite - its outcry." 34. "Chaotic Of Echoes The Lands Darkest Hours Of LionsArchitect the Garlots of War The Precognitions"
35. "Stars, too, were time travelers. How many of those ancient points of light were the last echoes of suns now dead? How many had been born but their light not yet come this far? If all the suns but ours collapsed tonight, how many lifetimes would it take us to realize we were alone? I had always known the sky was full of mysteries—but not until now had I realized how full of them the earth was." 36. "Marriage has a unique place because it speaks of an absolute faithfulness, a covenant between radically different persons, male and female; and so it echoes the absolute covenant of God with his chosen, a covenant between radically different partners." 37. "She considered what had made Denmark home to her anyway. Was it the sense of familiarity? That wherever she went there were echoes of a hundred memories she could pluck from her thoughts?" 38. "They passed the hall, that echoes still,Pass as lightly as you will.The brands were flat, the brands were dying,Amid their own white ashes lying;But when the lady passed, there cameA tongue of light, a fit of flame;And Christabel saw the lady's eye,And nothing else saw she thereby,"
39. "And we held each other in the dark hall and laughed, with the tears running down our cheeks and echoes of our laughter going up the ruined stairway to the sky. 'I am so happy,' Constance said at last, gasping. 'Merricat, I am so happy. ''I told you that you would like it on the moon." 40. "Epic is a word we often hear overused these days. Epic is Echoes or the guitar solo in Comfortably Numb. THAT is "Epic." 41. "He hesitates only a moment before pulling me close, arms tightening around me, mouth meeting mine the same way it did before. Purely, sweetly, wickedly, perfectly. He sighs against my lips, a sound of such relief it echoes through my skin, making me smile and our teeth bump together. I know exactly how he feels. How it feels to come home, to find sanctuary, to be handed that missing piece that makes life not something to be endured, but something to be celebrated." 42. "In the dark, in no starlight at all, the blocks hurtled invisibly by, ejected into the night air; he heard them break but he believed it was only the echoes of broken windows, not even his broken windows but someone else's in some other city, people all over the night searching madly for those who transmitted the vague and unpersuasive frequency of destiny, not even this night but some other night that came before, from which the sound of breaking windows reached him only now like the light of novae. Ice busting in the dirt. The storm turned north." 43. "His copy was full of lofty echoes: Greek Tragedy; Damocle's sword; manna from heaven; the myth of Sisyphus; the last of the Mohicans; hydra-headed and Circe-voiced; experiments with truth; discovery of India; biblical resonance; the lessons of Vedanta; the centre does not hold; the road not taken; the mimic men; for whom the bell tolls; a hundred visions and revisions; the power and the glory; the heart of the matter; the heart of darkness; the agony and the ecstasy; sands of time; riddle of the Sphinx; test of tantalus; murmurs of mortality; Falstaffian figure; Dickensian darkness; ..."
44. "In older myths, the dark road leads downward into the Underworld, where Persephone is carried off by Hades, much against her will, while Ishtar descends of her own accord to beat at the gates of Hell. This road of darkness lies to the West, according to Native American myth, and each of us must travel it at some point in our lives. The western road is one of trials, ordeals, disasters and abrupt life changes — yet a road to be honored, nevertheless, as the road on which wisdom is gained. James Hillman, whose theory of 'archetypal psychology' draws extensively on Greco–Roman myth, echoes this belief when he argues that darkness is vital at certain periods of life, questioning our modern tendency to equate mental health with happiness. It is in the Underworld, he reminds us, that seeds germinate and prepare for spring. Myths of descent and rebirth connect the soul's cycles to those of nature." 45. "Is it necessary to add that the echoes of many characteristic tales, dating from that picturesque time, still linger about here, in more or less fragmentary form to be caught by the attentive ear? Some of them I have repeated; most of them I have forgotten; one I have never repeated, and assuredly can never forget." 46. "In 1952, Muddy cut the song 'Rollin' Stone.' It was a nationwide success, and the song echoes down through rock n' roll history. Bob Dylan cut a tribute by the same name, an English band decided to call themselves the Rolling Stones, and the magazine that first embraced music as a serious cultural phenomenon was itself called 'Rolling Stone.'" 47. "Echoes of my past will always have a low frequency vibration in my present lest I forget the road travelled to reach the enjoyment of today." 48. "Soundless echoes - no voice,Sadness doth keep thee at bay,Stagnation rises as ebb & flow,Nothing alters,Unless you choose to break away." 49. "On the terrace of the Pepiniere, the 150 pupils of the Institut Chemique talk chemistry as they leave the auditoria and the laboratory. The echoes of the magnificent public garden of the city of Nancy make the words reverberate; coupling, condensation, grignardization. Moreover, their clothes stay impregnated with strong and characteristic odours; we follow the initiates of Hermes by their scent. In such an environment, how is it possible not to be productive?" 50. 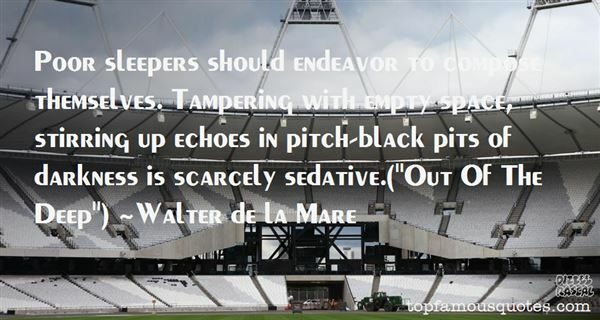 "Poor sleepers should endeavor to compose themselves. Tampering with empty space, stirring up echoes in pitch-black pits of darkness is scarcely sedative. ("Out Of The Deep")"
Tu es ma came, plus mortelle que l'héroïne afghane, plus dangereux que la blanche colombienne, tu es ma solution à mon doux problème."